Book us for your Newport Private Sunset Cruise! 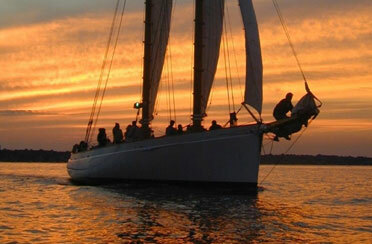 Join us for a magical Newport RI sunset sail aboard the legendary Schooner Adirondack II or Sloop Eleanor! Newport is famous for its sailing and sunset and there is no better way to watch this stunning phenomenon than aboard the luxurious Schooner Adirondack II or Sloop Eleanor as you enjoy some Newport sailing. Enjoy this sunset cruise and let our professional crew cater to you while you sit back and relax, enjoy some refreshments, and take in the memory of a Newport sunset that will last a lifetime. On this boat ride there is multiple opportunities to snap some amazing photos for your social media feed or to be framed for the mantel. Not only is Newport sunset sailing magical but it is our most romantic and relaxing sail we offer. This sunset sail will not only create a memory that will last a lifetime, but it will keep you coming back to Newport over and over again. The Schooner Adirondack II is certified up to 57 guests while the Sloop Eleanor is certified for 24 guests. Catering and Bar are available on all private events. Contact us to book your Newport Private Sunset Sailing aboard one of these magical yachts!